Let your bright and wild side out with these Yacht CVS sneakers from Puma, as they feature exteriors of high risk red, while the padded footbeds ensure a comfortable stride. Whether you’re headed to a party or just a casual meet up with some friends, these sneakers will do absolute justice, especially when teamed with cargo pants, a black t-shirt and a red jacket. 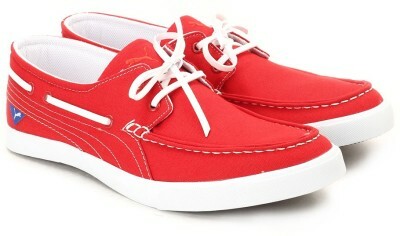 Based in Germany, Puma is synonymous with comfort and style. Makers of stylish sports shoes, the brand keeps you in sync with the latest fashion trends. Footwear Care Air the shoes out after every use. Wipe clean with a soft cloth. Weight: 310 gm (per single Shoe) - Weight of the product may vary depending on size.